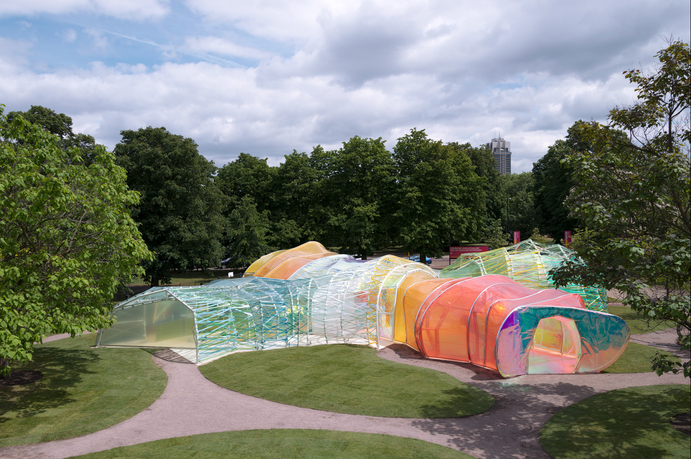 selgascano, Serpentine Pavilion 2015. Photo: John Offenbach. The Serpentine's annual Pavilion commission is the most ambitious architectural program of its kind worldwide and celebrates its fifteenth anniversary this year. 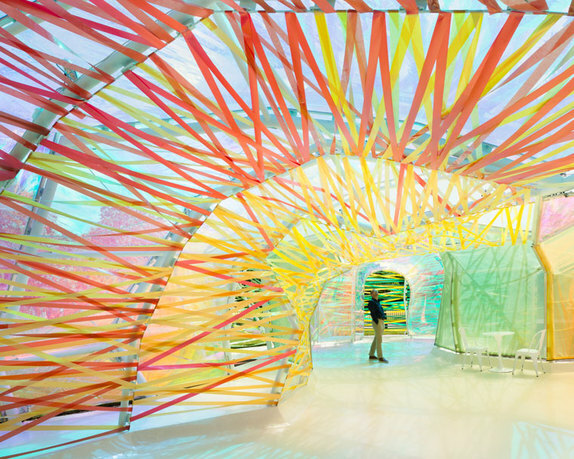 Spanish architects selgascano designed the 2015 Serpentine Pavilion. 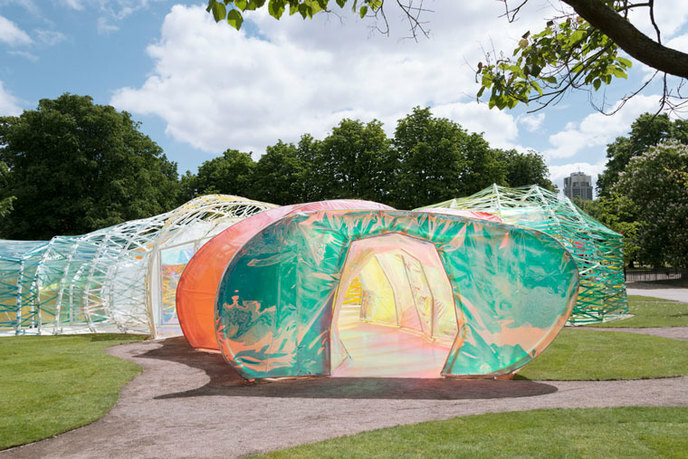 The award-winning studio, headed by José Selgas and Lucía Cano, is the first Spanish architecture practice to be asked to design the temporary structure on the Serpentine's lawn in London's Kensington Gardens. In keeping with the criteria of the scheme, this is the studio's first new structure in the UK. 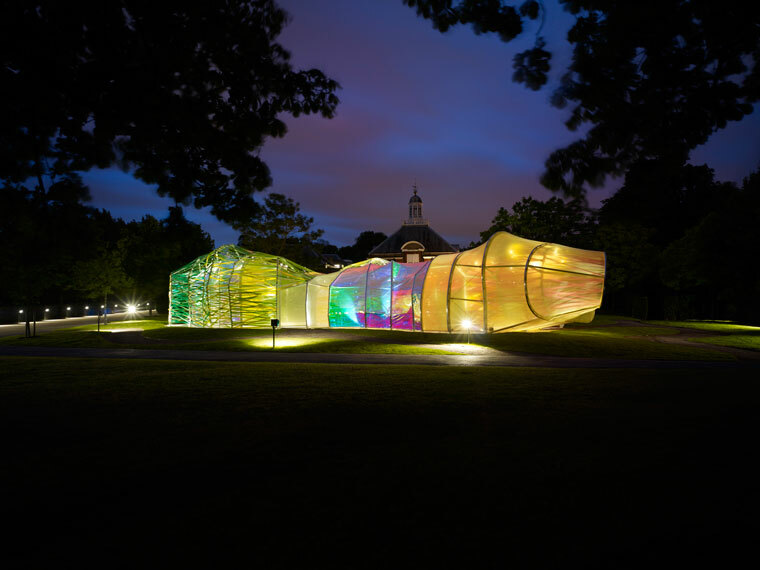 The Pavilion is an amorphous, double-skinned, polygonal structure consisting of panels of a translucent, multi-colored, fluorine-based polymer (ETFE) woven through and wrapped like webbing. Visitors can enter and exit the Pavilion at a number of different points, passing through a “secret corridor” between the outer and inner layer of the structure and into the Pavilion's brilliant, stained glass-effect interior. José Selgas and Lucía Cano established selgascano in Madrid, Spain, in 1998. Both born in Madrid in 1965, Selgas and Cano studied architecture at the Escuela Técnica Superior de Arquitectura de Madrid and graduated in 1992. Selgas worked with Francesco Venecia in Naples, winning the Rome Prize from the Academia Española de Bellas Artes de Roma in 1997–98. Cano worked with renowned Spanish architect Julio Cano Lasso and was a member of his studio until 2001. SelgasCano studio has completed the majority of its buildings in Spain, through a diverse range of commissions, including Silicon House, Madrid; El “B” Cartagena Auditorium and Congress Centre, Cartagena; and Office in the Woods, Madrid. The architects' international work includes the City Administration Building, Stockholm, and they are currently working on a number of projects worldwide, including “Pip” House, in Laurel Canyon, Los Angeles. 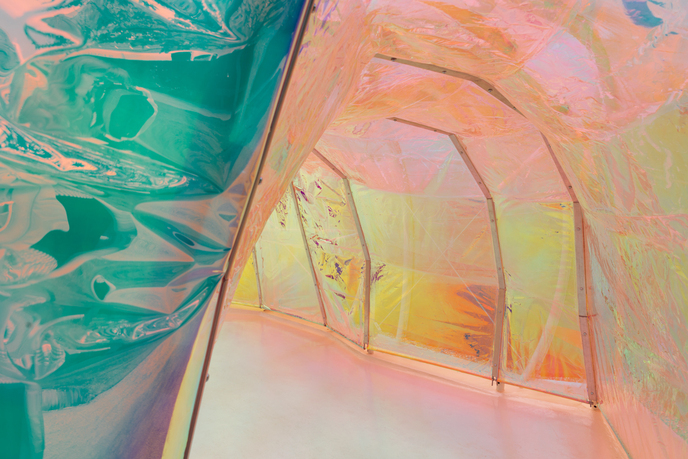 SelgasCano's work has been exhibited at the Museum of Modern Art, New York; the Museum of Contemporary Art, Tokyo; the Design Museum, London; the Akademie der Kunste, Berlin; and Tin Sheds Gallery, Sydney. In 2012, the architects exhibited in the Spanish Pavilion at the 13th International Architecture Biennale, Venice, as part of SPAINLab. In 2013, they won the Kunstpreis awarded by the Akademie der Kunste, Berlin, and were named “Architects of the Year” by the German Design Council in Munich. Julia Peyton-Jones is the director of the Serpentine Gallery and codirector of its exhibitions and programs. 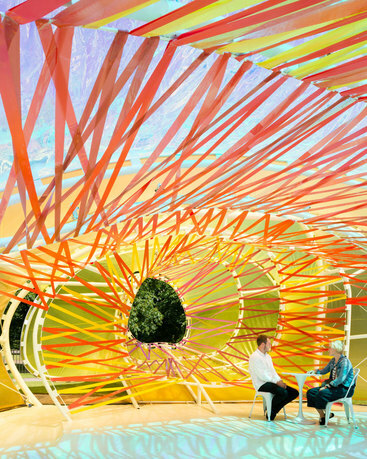 Peyton-Jones conceived of the Serpentine Pavilion Program in 2000 as a pioneering way to present contemporary architecture to the public in the form of a built space, rather than plans and models. Hans Ulrich Obrist is the codirector of the Serpentine Galleries exhibitions and programs and the director of international projects. Obrist joined the Serpentine in 2007 and has worked with Peyton-Jones to program and release the yearly Serpentine Pavilion commission. Emma Enderby is a curator at the Serpentine Galleries, working with the wider team to release the Pavilion commission. The Serpentine Galleries are the only publicly funded modern and contemporary art galleries in central London to maintain free admission with full disability access. The Serpentine's mission is to commission emerging and established artists, architects, and designers to present existing and create new work across all art forms, while attracting up to 1.2 million visitors a year. The Serpentine Gallery was founded in 1970 and opened its second space, the Serpentine Sackler Gallery, in September 2013.